On 12th January, it was the day for the tiny tots of Sandeepani Sishuvihar. It was 'go as you like' for them. All the 15 tiny tots were dressed by their mothers as stalwarts of ancient and modern India. From Sri Rama, Mother Sita Sri Lakshmana and Sri Hanuman to Adi Sankaracharya and from Unni Archa to Sri Narendra Modi, all were present on stage. Sri Ramakrishna, the Holy Mother and their Swami Vivekananda were there to bless the audience. Sister Nivedita and Swamiji accompanied by Mananeeya Lakshmi Didi lighted the lamp to start off the programme. Each character had some message for the audience. Each child had beautifully mastered their short speech and delivered it in front the audience only to keep them spellbound with wonder! Amongst the audience were the children's' parents, yoga varga and satra participants and the inmates of Anandadham. Mananeeya Didi while speaking to the kids tiny tots and the audience stressed the need of sowing the seed of this love for the Nation's heritage by introducing to them the great heroes of our land who made India proud by their patriotism, their spirituality and the multifaceted talents, who selflessly work for the upliftment of the Nation and who are a constant source of inspiration to all. It was a short but sweet programme appreciated by all. Jayanthi and Sister Nivedita 150th Anniversary. The Chief Guest for the programme was Smt Jyothi Unniraman, a very close well wisher of Kendra. 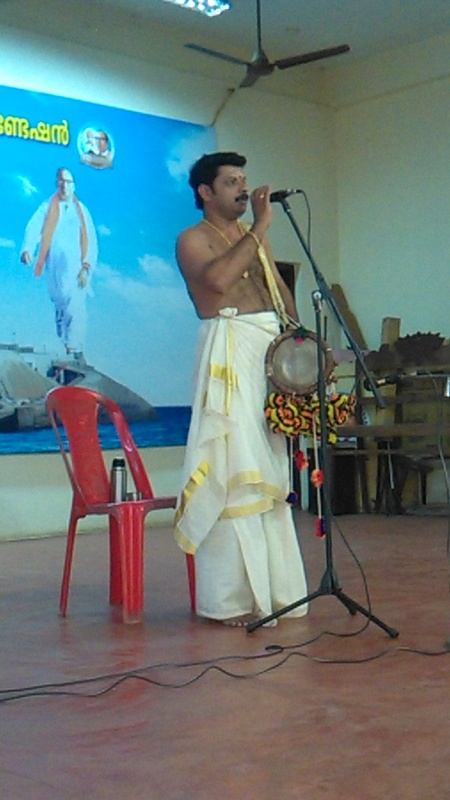 The programme started with Sopana Sangeetam by famous Soupana Sangeet Singer Sri Eloor Biju from Paravur. Smt Jyothi Unniraman gave a brief sketch of the life and message of Sister Nivedita. Mananeeya Didi spoke on Swamiji. The winners of Patriotic and Folk songs, both juniors and senior presented their songs on stage. Prizes were given away by the Chief Guest. The Rolling Trophy for the best Patriotic Song Group was shared by Govt.U.P School Konathukunnu and Bharatiya Vidya Bhavan, Irinjalakuda and the Trophy for Folk song went to Shantiniketan International School, Kodungallur. Scholarships of Rs 500/-for financially backward yet high grade scorers of Govt Girls Higher Secondary School, Kodungallur were given to five students of Class X and five of Class XI. The highest grade holder of XI class too received an amount of Rs 1000/- as scholarship . The programme concluded with Shanti mantra.